Fishing hooks come in a variety of types and size, and it’s often difficult for a fisher to narrow down their choice for crappies fishing. For example, anglers that are using minnows might need their hooks to have some key traits. The best fishing hooks for crappie should be long enough, lightweight, and sharp. The best sizes of crappie fishing hooks range between 2, 4, and 6, but fishers can get all these characteristics in one type of hook. As an angler, consider opening up the hook or sizing it slightly if none of your hooks gets a catch. Experts recommend anglers to prioritize red-colored hooks because they can entice a fish more than silver and gold hooks. Anglers should try these tips and will be surprised how easy it is to reel their limit. Of course, every angler wants their fishing hook to be as sharp as possible. It has to pierce both the mouth of crappie and the minnow with ease. The best way to check the sharpness of a hook is to drag it on a fingernail. A sharp hook will leave a scratch on the nail, but if it doesn’t, an angler can toss or sharpen it make it sharper than before. Sizes 2, 4, and 6 are the most common crappie fishing hook sizes. However, anglers with the intention of using extremely large or small minnows may consider going outside of this range, but the chances are that their catch will be massive if they stick in the middle. With long-shanked hooks, anglers can get their hook out of the mouth of a fish, especially when it’s stuck. You may also consider using light-wire hooks to ensure that the hook doesn’t free up or bend when snagged. Light-wire hooks are also thin enough to make it harder for crappies to notice, allowing anglers to kill fewer minnows with tiny hooks. For a successful catch, anglers might need to bend their hook about 10 degrees when setting it. Bending can be a game changer when the crappies are biting, but the fisherman can do nothing to land them. The following are the right types and sizes of hooks and lures in the market. It is a set of fishing hooks that contains 150 hooks with different styles. It includes 60 bait holders of four different sizes, 45 octopus hooks of sizes 2, 4, and 10. Along with barbed bait holders, there are 45 long shank hooks, which work well for anglers interested in species of fishes such as catfish, trout, and perch. These hooks contain steel stainless properties, and anglers can use them for a long time. 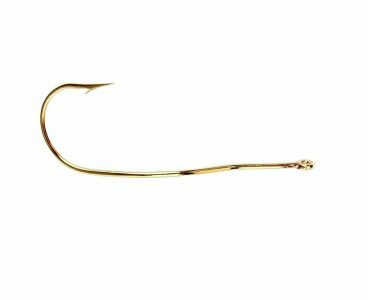 These hooks are an alternative when the classic gold or silver hooks fail to produce the desired results. Most crappie fishers believe that these red hooks are the best for crappie. These hooks are an ideal choice, and most of their brand come in color red. It refers to a fishing hook that anglers can use to attract big fishes. Their shape resembles a fish and is fitted with 3D eyes to trick big fish in the sea that it’s a real bait. Of course, big fish think of this hook as prey, and some will even try to eat it. LotFancy hooks use vibrant color effects to attract big fish and capture them. These hooks are available in a variety of sizes that range between 1.57 and 3.66 inches long. LotFancy hooks are made with stainless steel and PVC plastic and come with a 1-year warranty. Unfortunately, anglers have no option to choose the shape and color as LotFancy hooks come in random. These hooks come in various sizes, but getting them in the market can be a challenge due to their skyscraping demand. The small-size freshwater fishing hooks come in a set that gives anglers the complete collection needed for fishing hooks. A set of these hooks have different sizes that range between 3 and 12 inches long. Freshwater fishing hooks are made of stainless steel, and anglers can use them to capture any freshwater fish species. A set of these hooks also come with a box made of plastic to allow anglers to keep hooks of different sizes. Freshwater fishing hooks are a necessity for a successful crappie angler. These hooks are an ideal choice for anglers interested in capturing small fishes and trout. Rust doesn’t affect these hooks at all as they are made with stainless steel. It is lightweight enough to rotate in the water. These hooks come in two variant colors, Gold and Platinum Black. They come in the traditional design and are designed for the anglers of small fishes. It comes with an organizer box that fishers can use to organize different sizes of fishing hooks. Its locking technology helps keep hooks arranged and ensure they don’t fall off. With a sinker organizer box, anglers can organize their tackles for walleye, crappie, and pinfish. In a nutshell, Plano hooks and sinker organizer box is something every angler should strive to have. These boxes are made with an unbreakable plastic material that helps keep the hooks safe all the time. These hooks have three edges designed for catching crappie, and each package contains 15 hooks. Each pack of Gamakatsu hooks includes different hooks of colors such as blue, red, bronze, black, and green. With this hook, anglers can capture crappie fish of any size with ease. Gamakatsu hooks can also last a lifetime as they are made with stainless steel that doesn’t need to be replaced over time. It is a lightweight fishing hook designed for stream fishing. With fine edge, Lazer Sharp hooks can capture any fish in a flash and can’t let any crappie go. Their vibrant color effects can also attract fishes of different sizes and increase your success rate. Besides, their stainless steel material makes them hard to rust and get damaged. While Lazer Sharp hooks are lightweight, twisting them is nearly impossible, and anglers can use them to capture any fish ranging from catfish to trout without any hassle. Anglers often try their luck with either a bobber or minnow, but most of them end up with a few fish or empty baskets. A successful fisherman could be fishing within a few meters with an unsuccessful fisher, but what sets them apart is their types of fishing hooks and techniques. Over time, crappie fishing has become a full swing in shallow water. Anglers can now capture crappies in spawning areas, as fishes tend to move into a spawn location before moving to deeper water as waves arrive in the shallow areas.